Description: The Micro Fanny is a simple, low-profile rectangular design, perfect for a smart phone or a wallet and keys. The main pocket has dual zipper heads, and we've updated the front pocket by adding gussets and a storm flap for greater protection from the elements. The bag is carried on a 1" webbing belt. Description: The Micro Fanny II is a teardrop-shaped "hip pack" design. Its features include a storm- flapped, zippered main compartment with dual zipper heads and a gusseted, zippered front pocket. 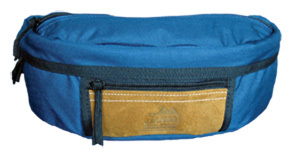 A zippered pocket on the back of the fanny pack is ideal for keeping extra money and valuables concealed. 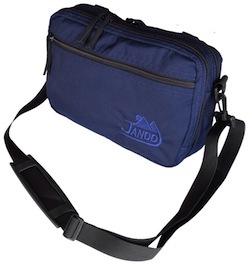 Description: Jandd Extra Small Fanny Packs utilize the time-tested banana shape that started the fanny pack phenomenon almost two decades ago. Both have 1.5" waist belts, dual zipper heads on a storm-flapped, heavy-duty zipper, and a flat storage pocket on top. Description: Jandd Small Fanny Packs also utilize the time-tested banana shape that started the fanny pack phenomenon almost two decades ago. Both have 1.5" waist belts, dual zipper heads on a storm-flapped, heavy-duty zipper, and a flat storage pocket on top. Description: The classy Montana, like our Extra Small Fanny Packs utilize the time-tested banana shape that started the fanny pack phenomenon almost two decades ago. Featuring a 1.5" waist belts, dual zipper heads on a storm-flapped, heavy-duty zipper, and a flat storage pocket on top. Description: The Medium and Large fannies have enough features to border on high-tech. Both feature an identical main compartment with a zippered mesh pocket for greater organization.The heavy-duty main zipper is storm-flapped for protection against the elements; the top of the pack has a bungee cinch strap. Description: The Large fannies have enough features to border on high-tech. Both feature an identical main compartment with a zippered mesh pocket for greater organization. The heavy-duty main zipper is storm-flapped for protection against the elements; the top of the pack has a bungee cinch strap. Description: The Deluxe Adventure Traveler can convert into a fanny pack, shoulder bag, canoe thwart bag and can also be attached to a bicycle creating a versatile handlebar bag. 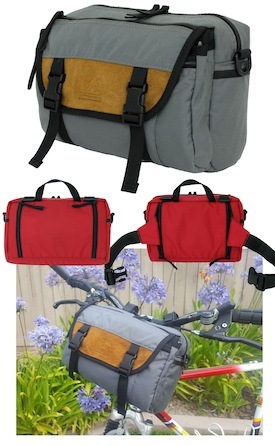 The bag also comes with a reversible rain cover and straps to attach the bag to bicycle handle bars and more. 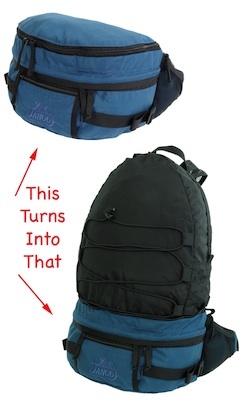 Description: This is a heavy duty Cordura® version of the money pouch as seen on most slot attendants in casinos. A 1.5 inch heavy nylon web belt attaches the pack at the side. The pack has 2 compartments a large rear compartment accessed through the top and forward pocket containing a currency sleeve. Description: One of our oldest designs, the Masada proves its value year after year. A true convertible, the Masada evolves from a very generous 500+ ci fanny pack to a 1500+ci daypack with a simple pull of a zipper. Opening the top compartment reveals comfortable mesh shoulder straps to complement the web.